The Pelton & Crane MagnaClave . . . If you are needing a 15" x 30" chamber on a freestanding system, without the bother or expense of external plumbing or ventilation or special water systems . . . The MagnaClave was once the way to go. Once but no longer. Because Pelton and Crane has discontinued the MagnaClave. Call us at 800-839-0722 to find out more about the system that has replaced the MagnaClave as the preferred 15" x 30" sterilizer on the market. The Once-Legendary Pelton and Crane MagnaClave Large-Chambered Sterilizer . . . Sadly Couldn't Cut It Any Longer. 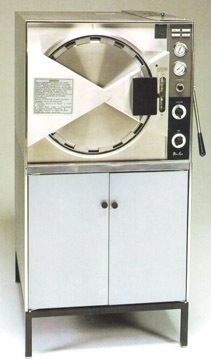 The MagnaClave by Pelton and Crane has long been one of the leading sterilizers on the market, and by far the most preferred large-chambered (15" x 30") system that was fully freestanding. No fussing with plumbing or water pumps or RO systems or ventilation. But in the end . . . they simply couldn't keep up in competition against the 15" x 30" Tuttnauer 3870EA. — Reason 1: The MagnaClave consistently cost about $4,000 more than the 3870EA. — Reason 2: The Tuttnauer 3870EA carries DOUBLE the warranty as the MagnaClave. — Reason 3: The Tuttnauer warranty covers parts and labor. Pelton only covered parts. — Reason 4: The performance of the Tuttnauer 3870EA ... was simply superior. — You still get a free-standing 15" x 30" sterilizer. The best-seller 5 years running. — You still get the stand to set it on (we include this for free). — You still have the option of a built-in printer for recording cycle data. — But with the Tuttnauer 3870EA you save a lot of money. — And you get a much better (much longer) warranty. — And on top of everything you get to enjoy the industry's best HEPA-air-filtered closed-door drying cycles. You are sure to love the Tuttnauer 3870EA. It's an incredible successor to the MagnaClave. And it has been the best-selling 15" autoclave for easily five years now. You can check out the Tuttnauer 3870EA by clicking here. Or if you prefer, just give us a call now: 800-839-0722 ... or submit the short form at the top of the page if you would like to learn more about the MagnaClave replacement: the best-selling Tuttnauer 3870EA. We can give you all of the info you need and provide you with a formal quote.